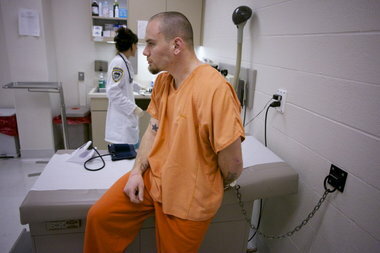 View full size Inmate Brian Rocheleau, 28, is examined in the health clinic within the segregation unit at Two Rivers Correctional Institution in Umatilla. 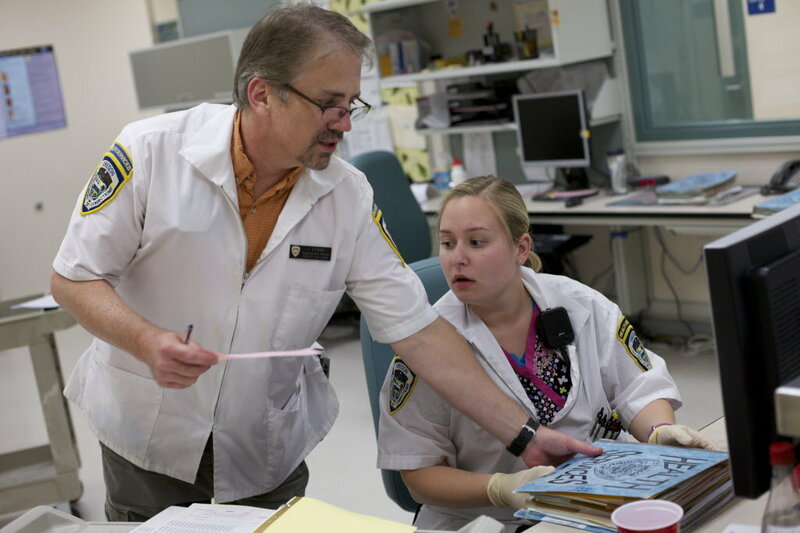 Corrections Department nurses provide the frontline care for increasingly complex health issues. 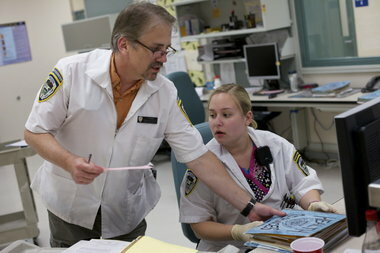 Two Rivers is budgeted for 19 nurses for 1,700 inmates — down one from the 2005-07 budget cycle. UMATILLA — Inmates stand in line, waiting to approach two nurses in the prison hallway. One at a time, they step forward for their free morning medicine. The nearly silent ritual unfolds three times a day outside the medical clinic within Two Rivers Correctional Institution. 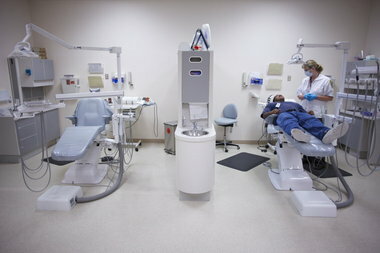 As the inmates wait, another settles into a dental chair, finally agreeing to no-cost treatment for a tooth problem that has left him surly. In a day room at the end of a hall lined with the prison equivalent of hospital rooms, a man sits in his wheelchair, staring at a television. He is alone — old, frail. This is his nursing home, courtesy of taxpayers. The men are among 1,700 inmates at Two Rivers who present a staggering array of medical problems. In March, medical personnel here handled 4,111 contacts with inmates. One-fifth were tested for infectious diseases, 554 calls were for digestive problems, and 257 for respiratory ailments. The clinic tested 233 new arrivals for tuberculosis. Such volume is routine as Oregon prisons strain to care for 14,000 inmates — inmates who are getting older and sicker, half arriving with mental health problems. State officials, boxed in by court mandates, have no choice but to treat them all. They spend millions of dollars, and the cost increases year by year. Legislators have more than doubled allocations for prison health care over the past 10 years. This session, legislators faced bitter choices in paring state services. They cut elderly care and treatment for youth addiction. But inmates won’t lose one bit of care. Prison health services cost taxpayers about $100 million a year — seven times the general fund spending on the state Education Department, four times the spending on the state Justice Department. That cost takes an ever-bigger share of the state prison budget — which itself consumes about 10 cents of every general fund dollar — rising from 6 percent in 2003-05 to 15 percent in 2009-11. With no insurer to help, the state pays for every case. Treating a 40-year-old woman inmate cost the state $1.1 million last year. That was one of nearly two dozen cases in the past year that cost more than $100,000 each. Inmates are guaranteed decent medical care, thanks to Texas inmate J.W. Gamble. Gamble, a convicted killer, was hurt in 1973 while unloading cotton bales on a prison detail. He sued prison officials for neglect and pursued his claim to the U.S. Supreme Court. Justices ruled in 1976 that poor medical care was “cruel and unusual punishment” forbidden by the Constitution. That opinion — Gamble v. Estelle — remains the rule. Ignoring the Supreme Court has proved costly for other states. A RAND study three years ago found 238 prisons were under court orders or agreements to improve care. For 30 years, Dr. Ron Shansky of Chicago has worked on behalf of courts to make sure such agreements are followed. States get in trouble, he said, for providing less than professional care or for not following doctors’ and nurses’ orders. Judges don’t accept lack of money as an excuse, he said. “If we’re out of money, we still have to provide the treatment,” said Bill Hoefel, Corrections Department health services administrator. Hoefel and his colleagues need only look south for a reminder of what happens when treatment falls short. The U.S. Supreme Court last month ruled that inadequate medical and mental care in California prisons is intolerable. The court said California, given one chance after another to make fixes, must bring down its prison population until all inmates receive adequate care. California authorities plan to shift thousands of future convicts to county jails, reduce sentences for some crimes, and speed up paroles to cut the prison population by 33,000 over the next two years. Inmate Rosario JumpingBull, 22, gets a filling with help from dental assistant Dustie Munsey at Deer Ridge Correctional Institution in Madras. All inmates get a complete dental assessment when they arrive, with Corrections Department dentists devising a plan for needed care. The state spends about $6 million a year on such care. Oregon, in contrast, expects its inmate population to continue growing. The prison system can’t turn inmates away because voters imposed more mandatory sentences and longer terms. Oregon prisons house 14,000 inmates — up from 10,400 a decade ago — and officials expect an additional 2,000 in coming years. Each one will be entitled to free health care, now costing an average of $567 a month. Besides sheer numbers and growing complexity, prison officials face the same pressures as any medical system — escalating prices for tests, drugs and specialized treatments. “A lot of the cost drivers are due to policy or political decisions outside the control of administrators,” said Ed Harrison, president of the National Commission on Correctional Health Care. Elderly inmates, in particular, are an increasingly costly challenge. Ten years ago, Oregon prisons held 258 inmates 61 and older. Now they hold 674. The geriatric prison population, on the rise across the country, has more serious medical issues than the average inmate. The percentage of Oregon inmates with heart problems, for instance, has nearly doubled in the past five years. Corrections officials say they spend $776 a year on a 40-year-old inmate’s health needs. That tab soars to $6,527 for inmates over 70. Inmates also enter prison older in body than age after years of drug and alcohol abuse, and infrequent health care, Kern and others said. A 50-year-old inmate often has problems typical of a 60-year-old, Kern said. “I’m just seeing sicker and sicker patients,” said Dr. Michael Puerini, medical director at Oregon State Correctional Institution and the next president of the Society of Correctional Physicians. View full size Registered nurse Jeff Combs and nurse Ashley Newman go over patient files for inmates at Deer Ridge Correctional Institution. The most recent statistics show that in March the nursing staff at the prison averaged 85 appointments with inmates a day. Not all care can be provided behind the razor wire. Inmates are taken to town for emergency room calls, surgery and more specialized treatments. In 10 months so far this fiscal year, the Corrections Department spent $12.5 million for 4,358 hospital visits. The average outpatient visit cost $1,771. The obligation to treat all cases produces eye-popping bills. That $1.1 million tab last year piled up for a woman who needed lengthy hospital stays for kidney disease and other conditions. She has since been paroled. A 51-year-old man with an aneurysm required outside treatment that cost $482,000. Even when the inmate causes the problem, the state has to pay. Last year, an inmate from Shutter Creek Correctional Institution in North Bend needed surgery and three weeks of intensive care for internal bleeding triggered by ibuprofen abuse. The cost: $61,904. View full size Medications await processing at the internal pharmacy at Two Rivers Correctional Center. 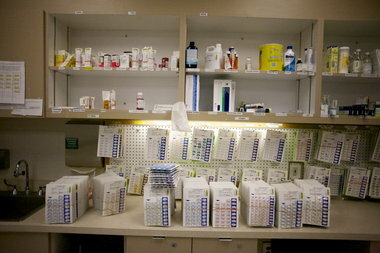 With 30,000 prescriptions to fill a month, Corrections Department officials buy in bulk for the state prison, going with generic drugs when possible. Most medication is handed out one pill at a time. Prison pharmacies cost the state about $14 million a year. Prison authorities try to contain such costs. They are working with a Colorado company, Correctional Health Partners, to more sharply monitor hospital stays. Medical directors meet daily by phone to move inmates out of hospital beds faster. And they are trying to keep inmates from going to the hospital in the first place. Chest pains, for instance, can be serious — or faked. “A weekend in the hospital is a vacation from prison for some inmates,” said Jeff Archambeau of Correctional Health Partners. Inmates also feign symptoms to dodge work duty or snag medication, prison officials say. The company and prison officials use databases to look for patterns that suggest an inmate is gaming the system. Prison authorities are also pressing to move more care inside prisons. A cardiology clinic held twice a month at Oregon State Penitentiary in Salem saves $5,000 a month. A dialysis unit established at Two Rivers Correctional Institution currently treats 26 inmates who otherwise might require more costly community care. Hoefel said the state also plans to try a program that “shows real promise” in helping inmates manage chronic diseases themselves, reducing the need for outside care. The agency hired a specialist to deal with the confounding challenge of hepatitis C among inmates. Hoefel’s unit also launched an analysis to strip out administrative steps that waste time or money. The state doesn’t always get it right, though. It had paid an average of $25,000 to settle cases for rejecting hernia operations before deciding two years ago that it was cheaper to provide the $6,000 operations. In April, the state paid $390,000 to settle a woman’s claim that her heart condition was mistreated while she was at Coffee Creek Correctional Institution in Wilsonville, and paid $75,000 to the estate of an inmate who died in custody. Portland attorney Michelle Burrows, who represents inmates who question their medical care, said she has seen improvements in the state system the past 10 years. “I do believe that medical personnel want to do the right thing. They just can’t” for lack of resources, Burrows said. Those personnel say they stretch the dollars they get. “We work really, really hard and spend a fair amount of time making sure we are managing taxpayers’ money,” Puerini said. Cost-cutting and efficiencies can’t be allowed to degrade care, Puerini said. He cited the example of an inmate with a short sentence who develops acute appendicitis.